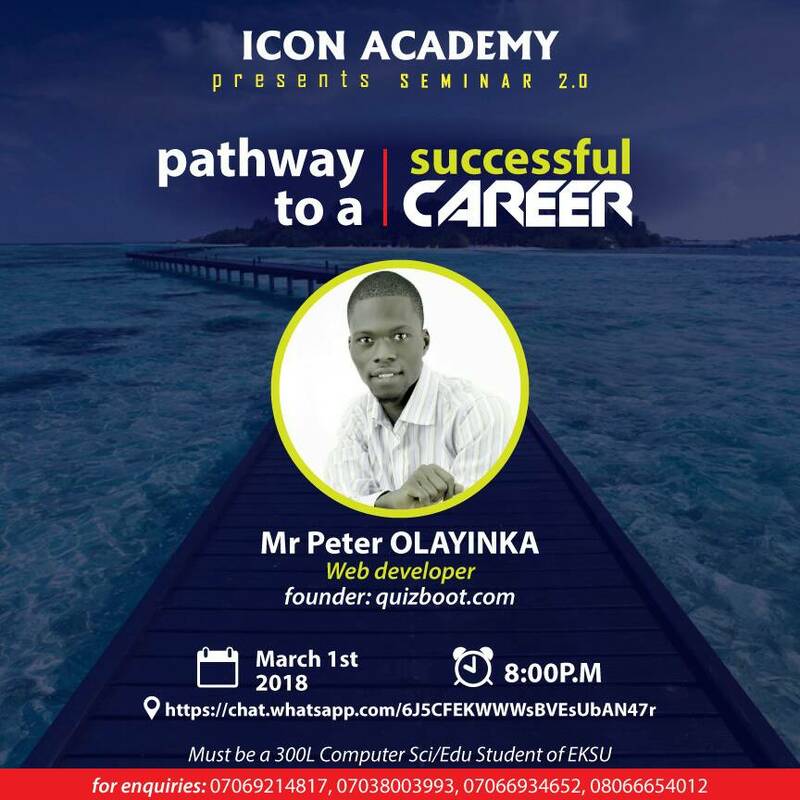 Icon academy is a group organized by the 300lv computer science of Ekiti state university. My dictionary tells me that career is an occupation undertaken for a significant period of a person's life and with opportunities for progress. This definition refers to what a person does to earn a living. According to Merriam-Webster’s definition of “success,” anyone who’s rich, respected, or famous is successful. With this dictionary definition, would you say that a success career is when you are rich or respected in what you do? Some of us would say yes and some would answer no,I would like to tell you the answer is something personal,So ask yourself...what do you want as a career success?Is it wealth? Fame? Respect?Or to impact others with what you do? Right?Why do you go to that person? Because he has set some value for himself,Let imagine you are a fashion designer and you sew only woman's cloth,By the time you level up and start sewing men's cloth you get job from me? By that you are loosing opportunity. If he had something you could handle (like a job offer, contract etc).Do you think he would ever refer you? That is your network,having a network of people that has the same orientation with you,people of like minds,grow a connect of relevant people. Every little opportunity you have to learn a thing or the other. Use it well,i would use myself as an example,Some years back i was learning to program in php, (just doing it for fun) then a year or 2 after i got connected with some set of guys(senior colleague). And they hooked me into their team of developers,If i didn't make use of the opportunity i heard when i was chanced i wouldn't get into their clique,And also sometime in 2016 I started learning python. While learning i thought to myself i can build a product out of this. After a while (quizboot.com) came my way,That isn't all.